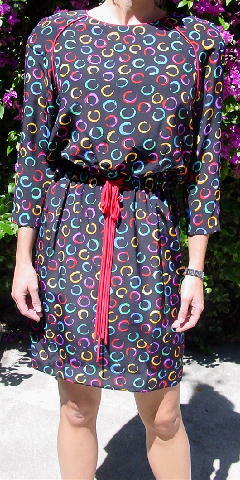 This vintage 100% silk dress is a Nipon Boutique. It has a black background with freeform partial rings in red, blue, green, white, yellow, and orange. There are shoulder pads, a wide jewel neckline, and raglan sleeves. 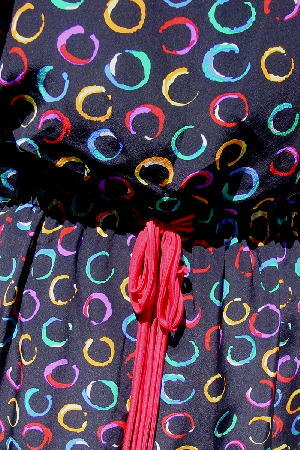 It has a 1" wide elastic waistband with 6 red faux drawstring ties in the center. The body has a black lining. It has a red cord accent trim around the neckline and around the raglan sleeves. The tag says it's size 8.
shoulder to hem 37 3/4"
armpit to armpit 19 3/4"